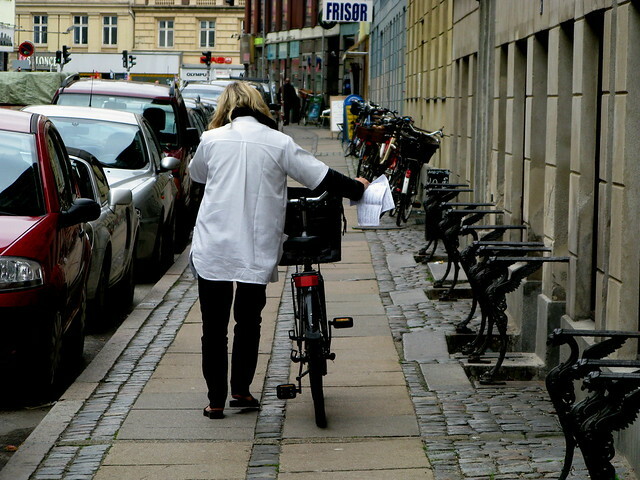 Copenhagen Nurse doing her rounds by bicycle. Don't be surprised if you see a cyclist in hospital whites pedalling about the city of Frederiksberg, in the middle of Copenhagen [population: 91,000]. Nurses providing post-natal care to new mothers and fathers ride around the city, and in Copenhagen as well, but treating the elderly in their own home has also proved to be beneficial. Frederiksberg Hospital sends nurses out to elderly citizens in order to treat them at home. An initiative that gives the elderly patients a greater peace of mind, but also saves money on hospitalisation. The nurses ride out to patients when a care home, a doctor or the person's home helper calls for assistance. The initiative has been in place since 2005 and it is now seen to bear fruit. Frederiksberg Hospital believes that 82% of the cycling visits have thwarted a potential hospital visit, because it was possible to treat the problem in the patient's own home. While the hospital is pleased to save money, it is the human aspect that really matters. The satisfaction rate among the elderly is high when they are not required to undergo a stressing hospital visit. On the financial side of the equation the hospital has estimated the savings. A hospital patient costs 3500 kroner [€460/$700] per day and is hospitalised for three days on average. By sending cycling nurses out to patients there are 220 cases where hospitalisation is avoided. That is a saving of 2.3 million kroner [€305,000/$460,000]. Add to that savings on ambulances, which totals roughly 450,000 kroner [€60,000/$90,000]. "Our two cycling nurses have years of experience and are most certainly capable of deciding whether the patient can be treated at home or sent to the hospital. They spend a good amount of time with each patient and the citizens enjoy a quality experience when they are treated in the comfort of their own home", says project leader Berit Juhl. Many other hospitals are now looking at how they can implement similar schemes.